As a growing University, Concordia Wisconsin replaced its existing 24 bed Coburg Residence Hall with a new five-story 360-bed suite style facility. 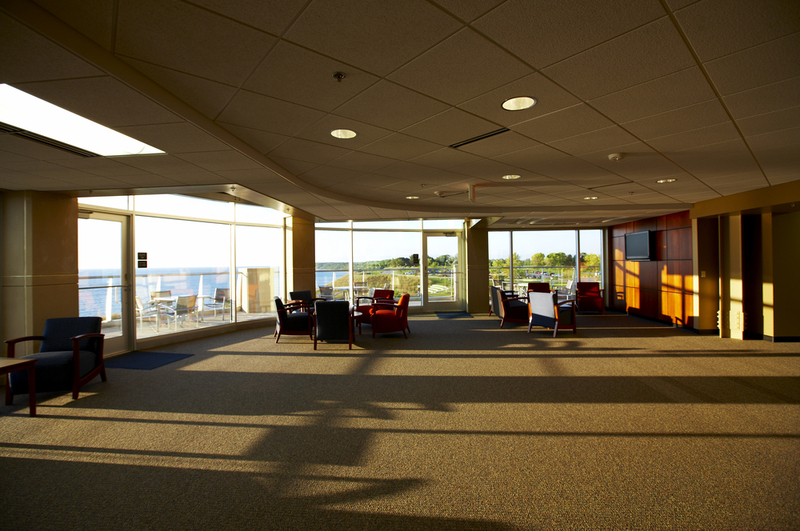 The design took advantage of Lake Michigan views as well as blending with campus architecture. Completed in 2008, Coburg Hall is Phase 1 of an expansion effort totaling 720 beds, which will bring enhanced living quarters to the campus by 2013. Older residence halls were replaced while conserving valuable campus green space. A few of the LEED principles incorporated into the design include natural day lighting in 90% of the rooms, operable windows, high performance glass, interior and exterior shading devices, exterior applied insulation system, heat recovery systems, and a high SRI roof membrane to minimize the heat island effect. Students now reside in suites with individual bedrooms and share amenities such as two- story lounge spaces with ambient fireplaces, wireless study rooms, centralized kitchenettes, and green roof patios. In addition, students now have an opportunity for a live-and-learn experience with classrooms provided in the facility.